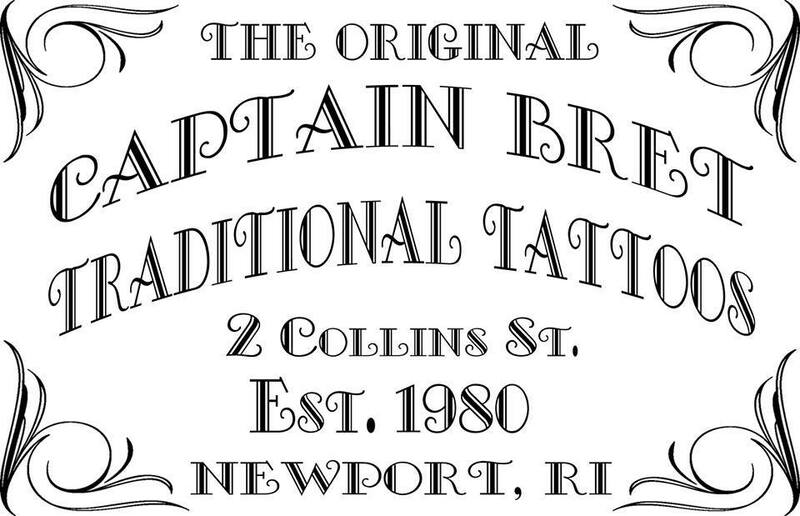 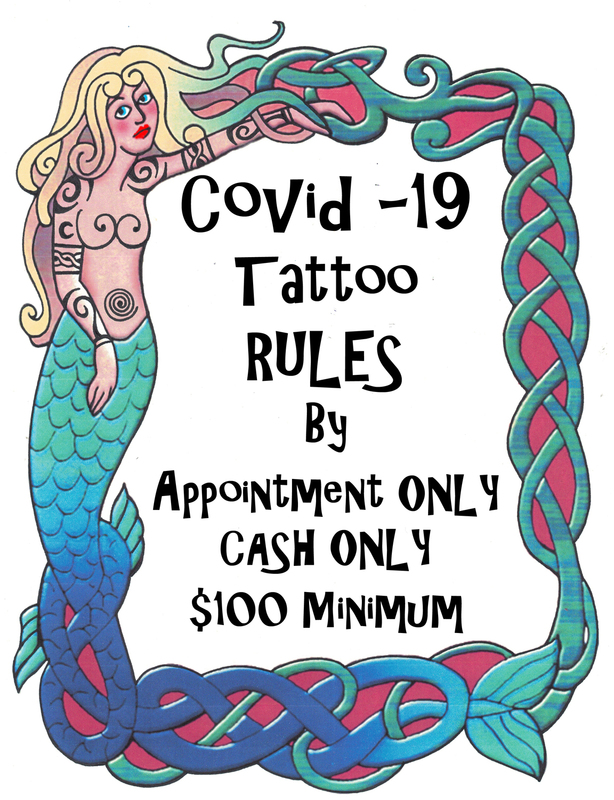 Offering Custom unique Tattoos, Nautical, Ladies Fine Line, Fancy Watercolors, Expert lettering and Calligraphy, Black & Grey, or, Extremely colorful designs, American Tradition Tattooing, Military, Sailor Jerry styles also. 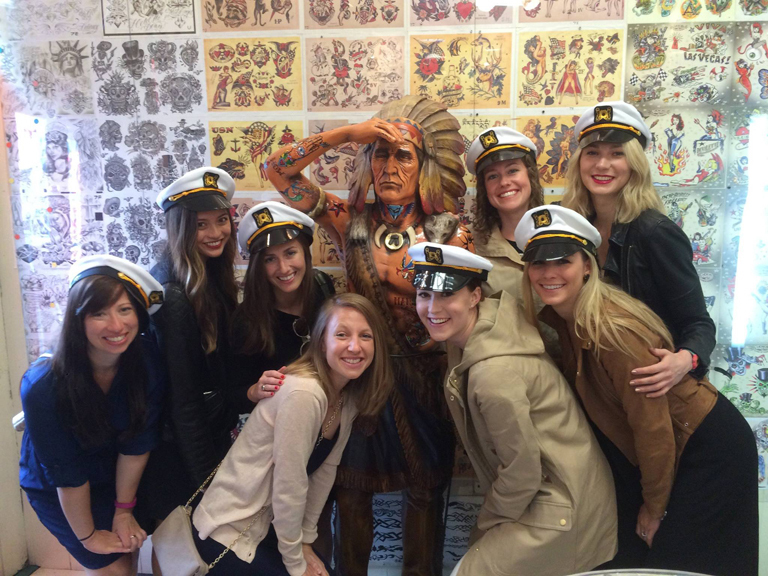 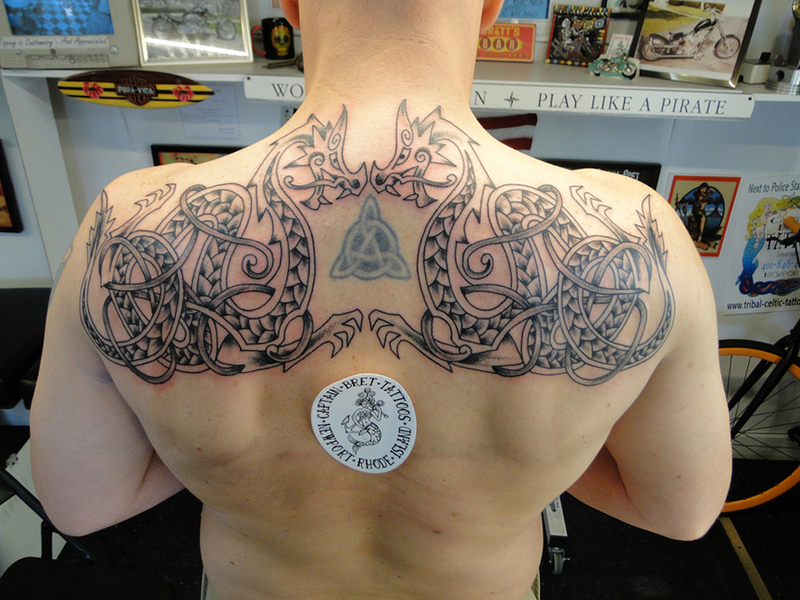 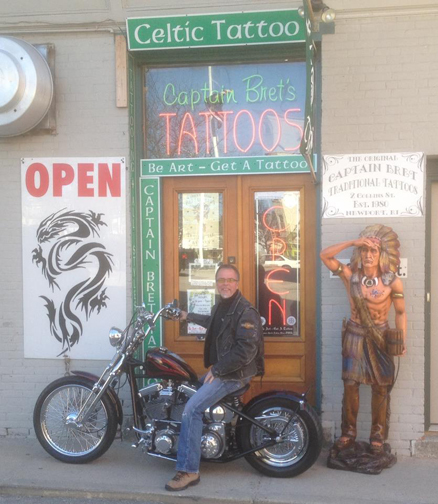 Tribal & Native Art specialist, Expert with COVER- UPS & Repairs, Realistic Tattoos, Dot work, Viking & Nordic Work. 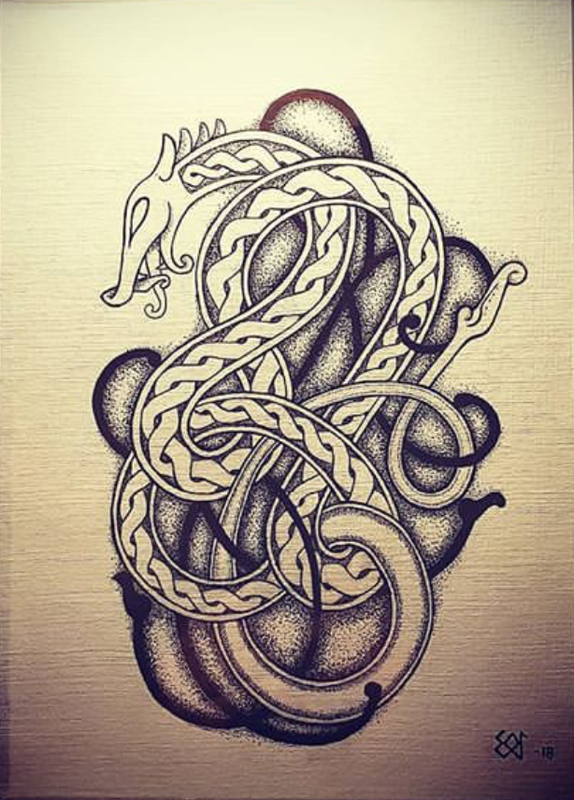 Dot-Work. 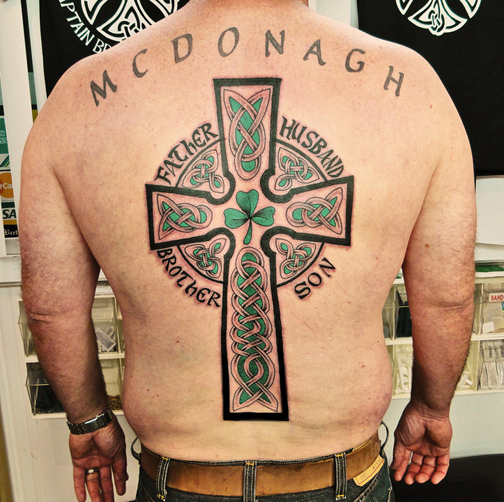 Renowned for CELTIC Tattooing. 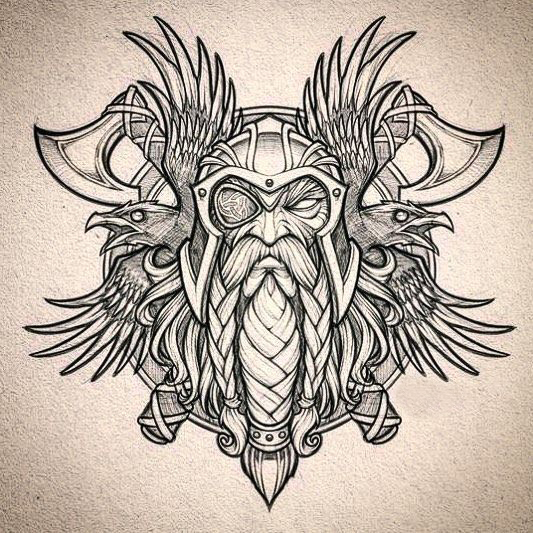 History tells that the Vikings were covered in tattoos from the tips of their fingers to their necks. 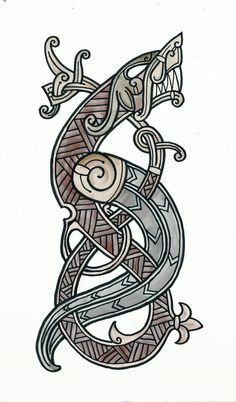 Viking tattoos were consist of ancient Norse symbols, various knot patterns or dark green symbols of trees. 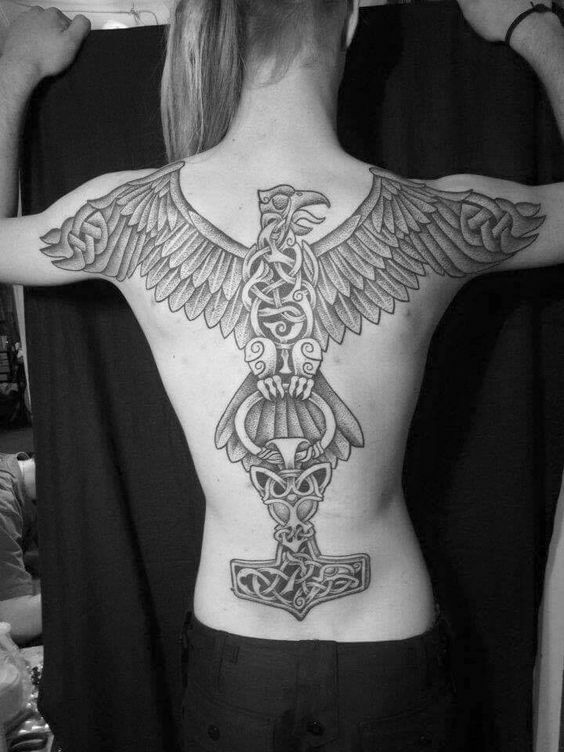 No one can really confirm the symbols or the patterns or designs that the Vikings used to use for their tattoos but it is likely that they would have used symbols from Norse mythology and the ancient designs found in their artworks on the jewelries, carvings on bones, boats and other artifacts. 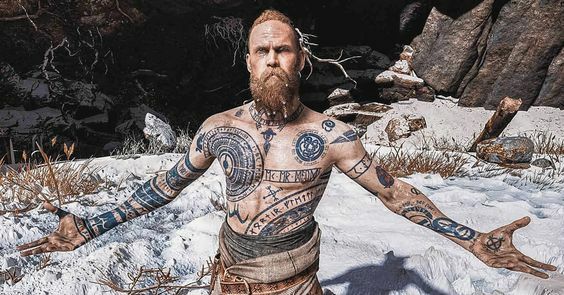 Did the Vikings have tattoos? 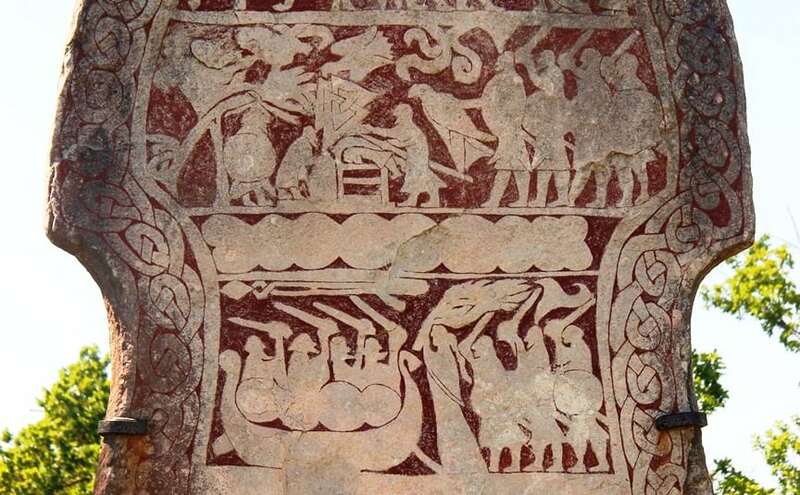 One piece of historical evidence says yes, at least those Swedish Vikings who raided and traded through Russia probably. 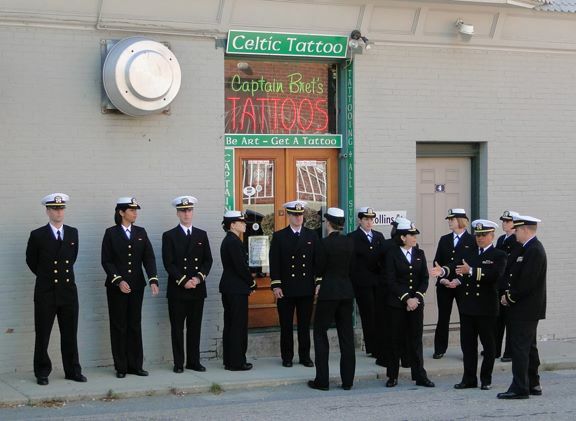 At one point he mentioned that all the men were tattooed from the tips of their fingers to their necks. 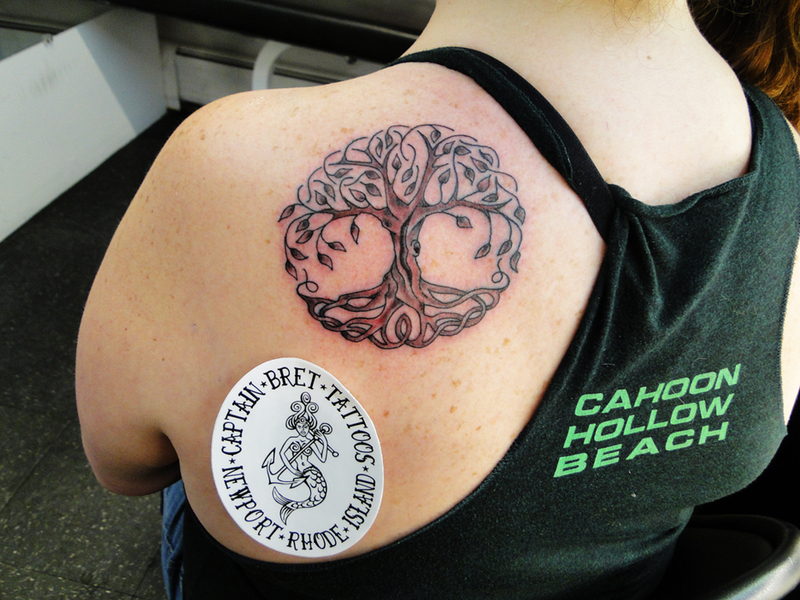 The tattoos were dark green figures of trees and symbols. 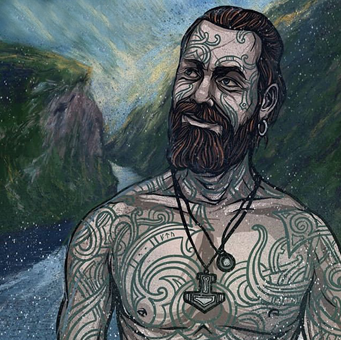 It is likely, however, that the tattoos were probably dark blue, a color that comes from using wood ash to dye the skin. 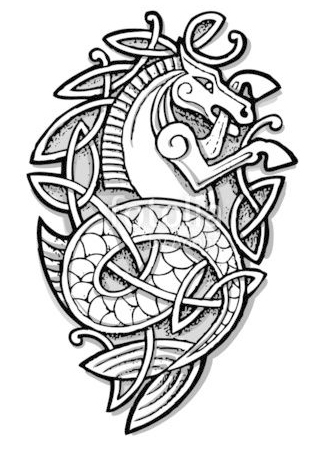 While Ibn Fadlan describes the tattoos as trees, he could have see the Vikings trademark gripping beast or other knotwork patterns of which the Vikings were Tattooed with. 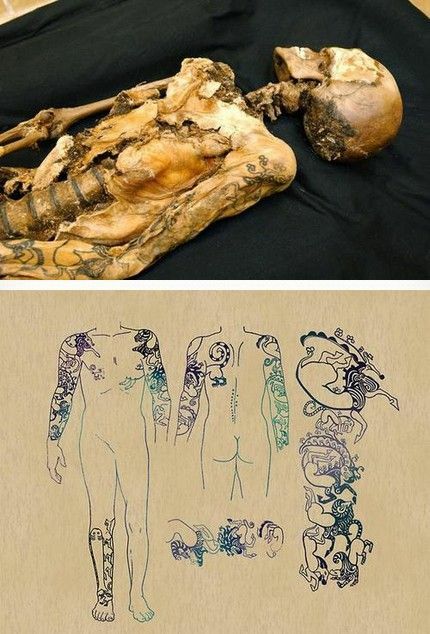 Unfortunately, human skin does not survive centuries of burial. 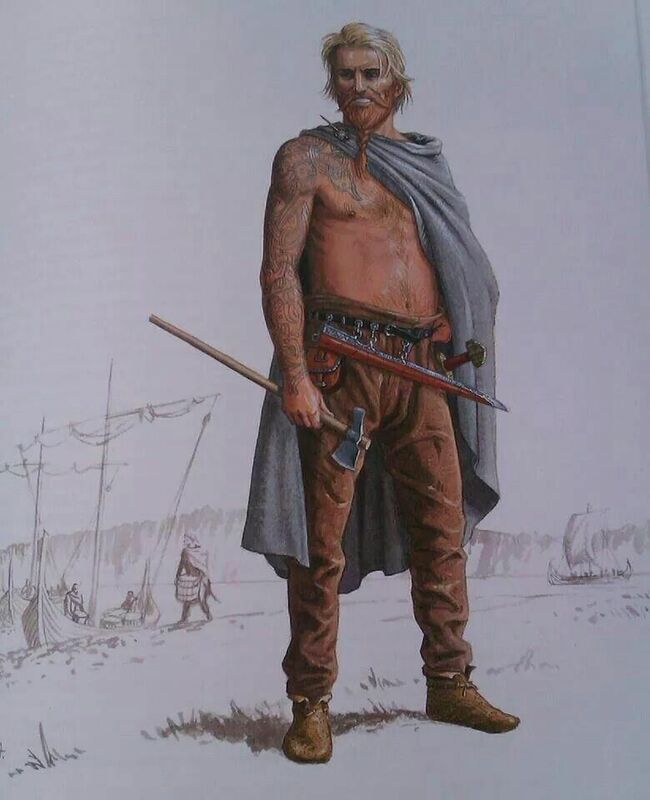 However, a Scythian chieftain was found in Siberia who had been buried circa 500 B.C. 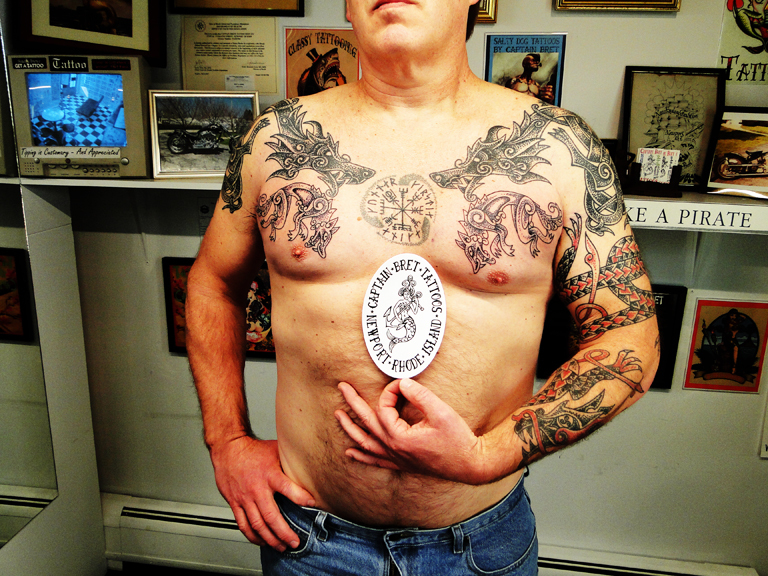 He had been buried beneath the permafrost, so his skin and tattoos survived. 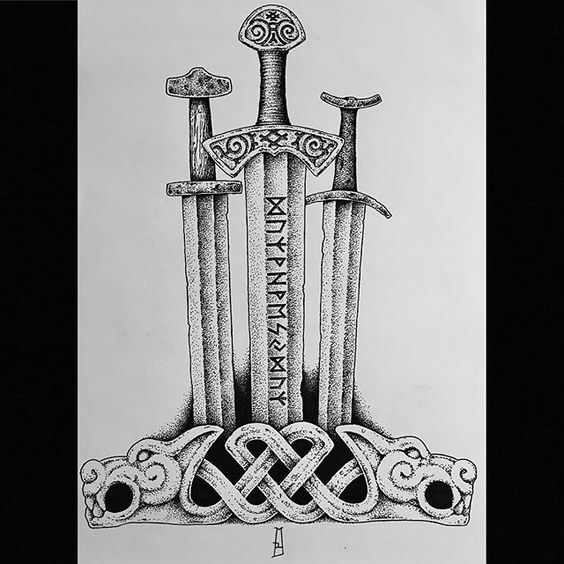 While this find predates Viking traders in Russia by 1300 years, it is possible that Vikings could have met the descendants of the Scythians while on trading missions in Russia and learned the tattooing art from them. 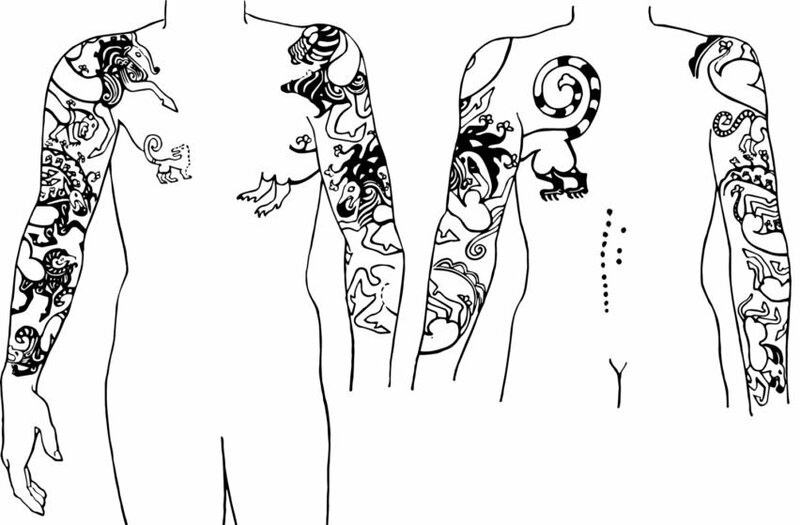 The Scythian warrior’s tattoos had Scythian art styles, of course. 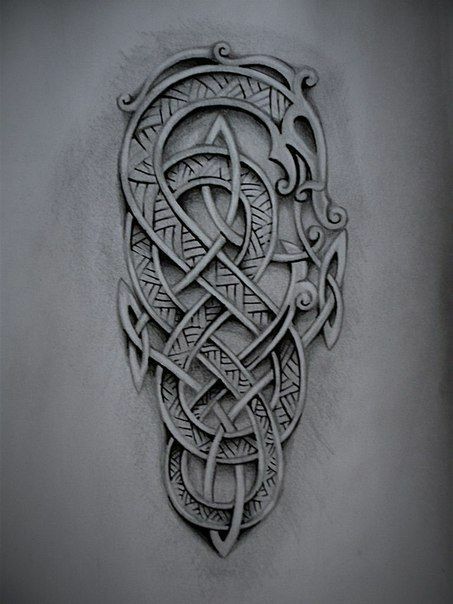 If Vikings did have tattoos, it is likely they would have used Norse designs and symbols found in their other artwork on bone carvings or jewelry. 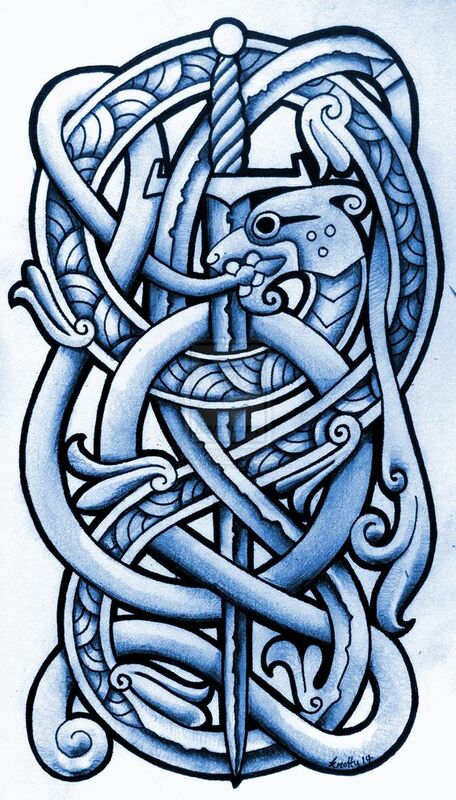 Both the Celtic and Nordic cultures used knot work, in their pottery, in their paintings, and even in their tattoos. 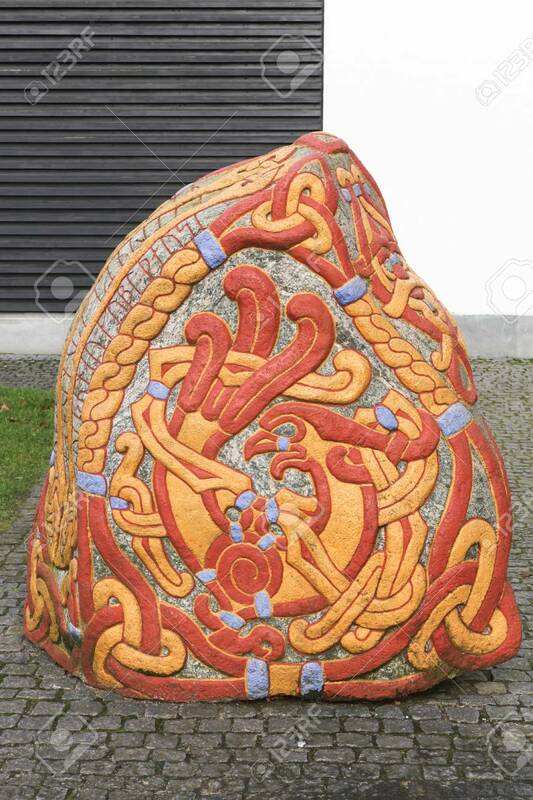 But as these two cultures were often at odds historically, how did they come to share this beautiful form of art? 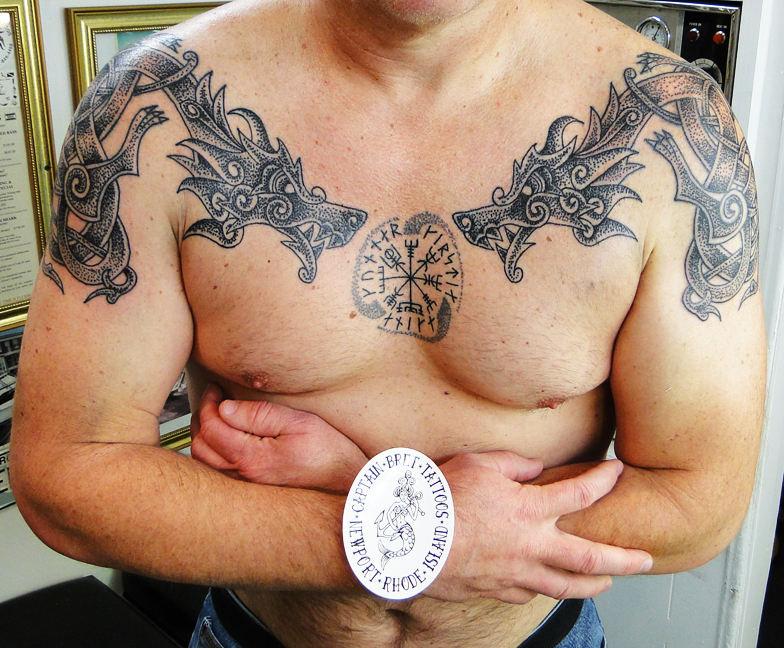 And most importantly, which should you choose to emblazon your arm with? 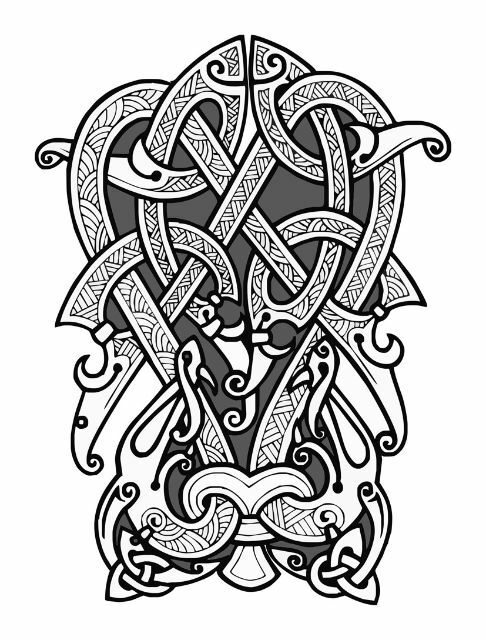 To begin, let’s compare Norse to Celtic knots. 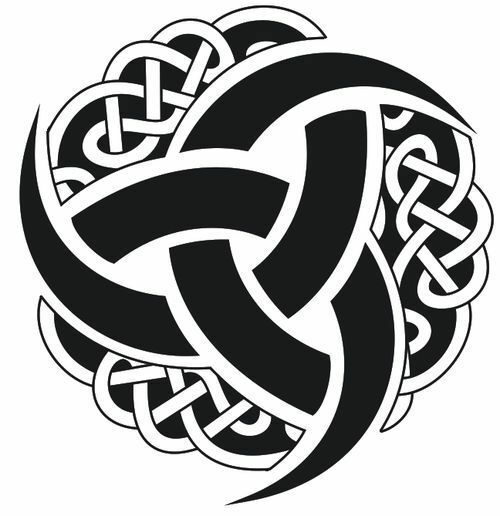 Celtic knot work, tends to fall under a very strict, mathematical format. 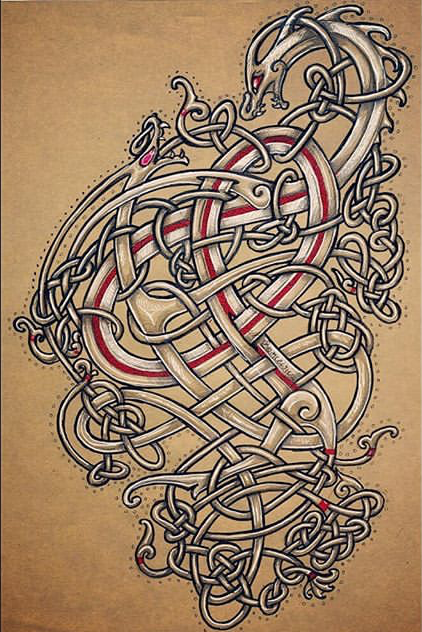 Celtic knots are well-defined, and typically one continuous, solid line that curls in and around on itself. 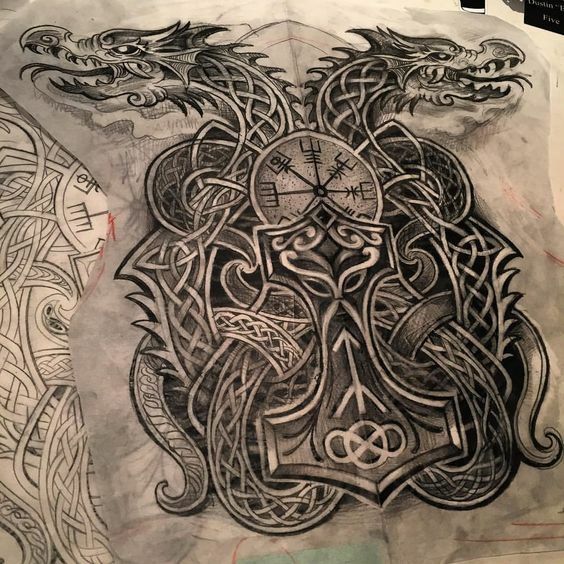 The kno twork in both countries are very similar, and thanks to their revival in tattoo shops around the world, a lot of modern-day artwork utilizes the influences of both cultures. 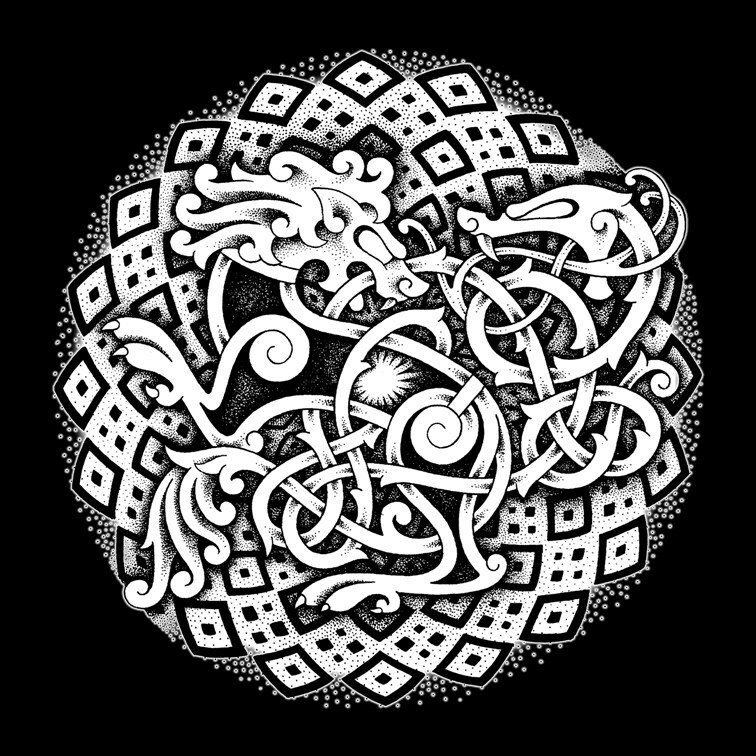 Typical Celtic motifs also include spirals, lace, key, and step patterns. 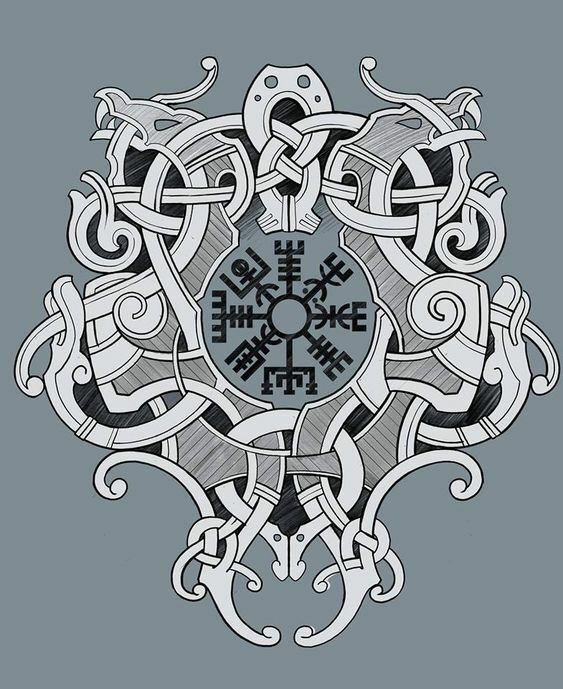 The line is heavier and the design is more abstract, whereas Norse/Viking art is more likely to depict people, animals, and things. 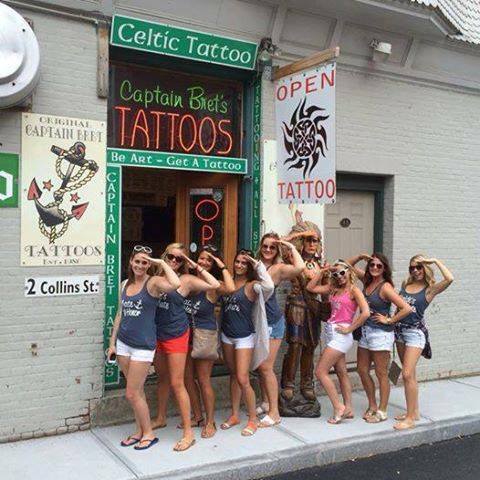 In terms of history, the Celts can claim they had the idea first. 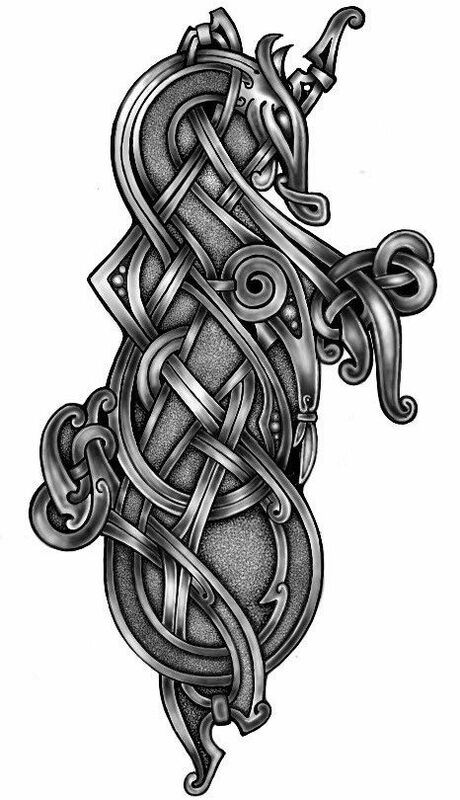 The oldest knot work in that region of the world comes to us thanks to the ancient druids. 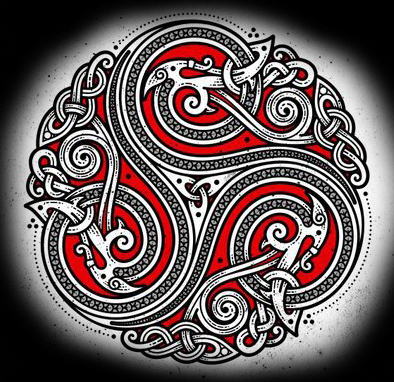 Judging by the spirals in places like Newgrange outside of Dublin, they may even have their roots in Neolithic times. 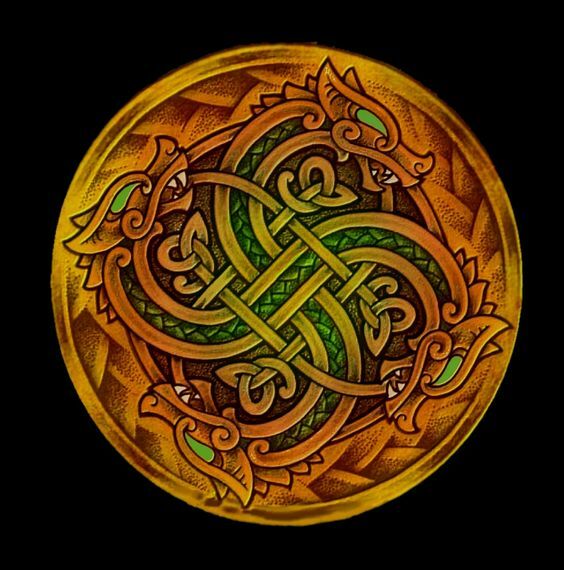 The artwork’s revival after the birth of Christ can be traced to the early 600s, when Celtic monks translated classic works from the east into the beautiful illuminated manuscripts that we love today, such as the infamous Book of Kells. 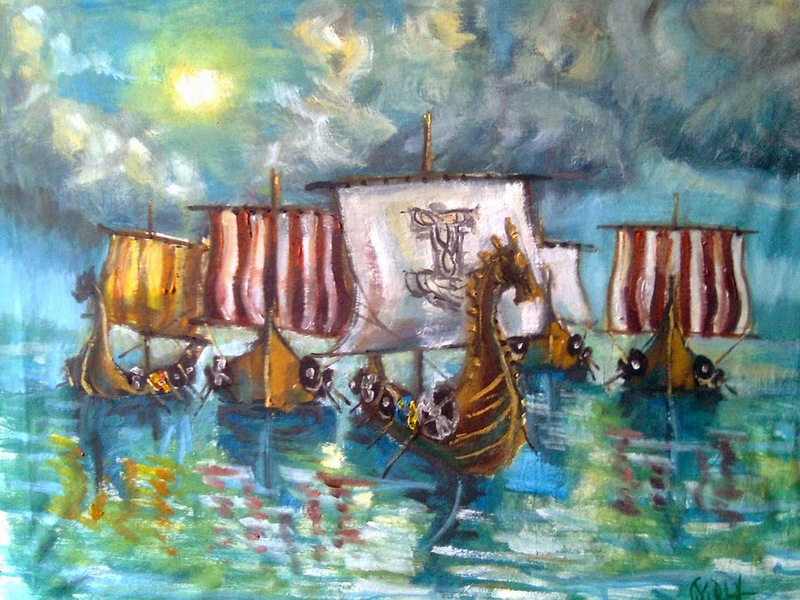 The Norse had long harried the shores of what is now the Scottish Orkney Islands, but during this time period and through 1200 AD, they made their way down the British coast to Cornwall, and even to Ireland. 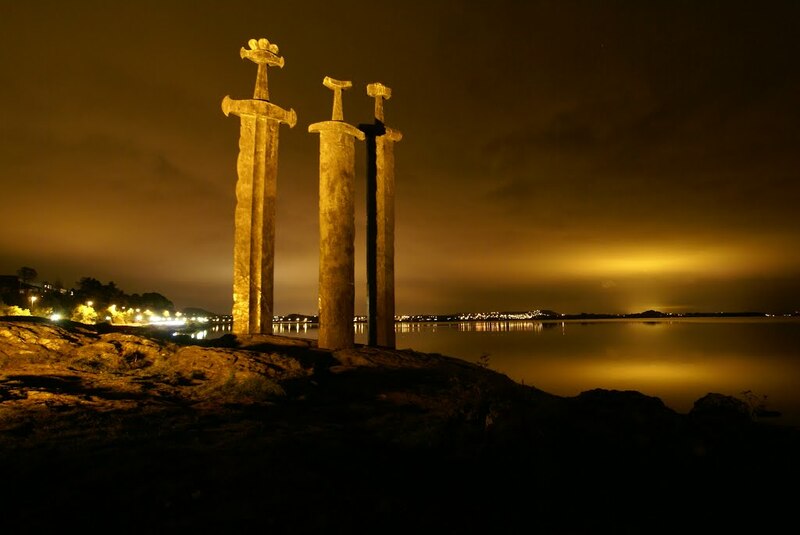 The two cultures influenced each other. 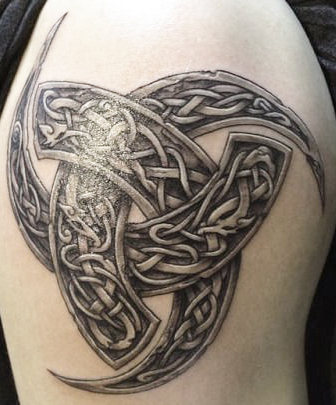 You even start to see Celtic knot work picking up people and animals, and losing their shape. 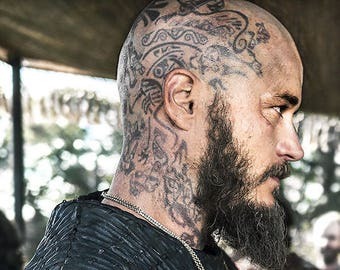 These days Viking tattoos are very popular among the people with Norse heritage who like to show their pride by carrying Viking tattoos on them. 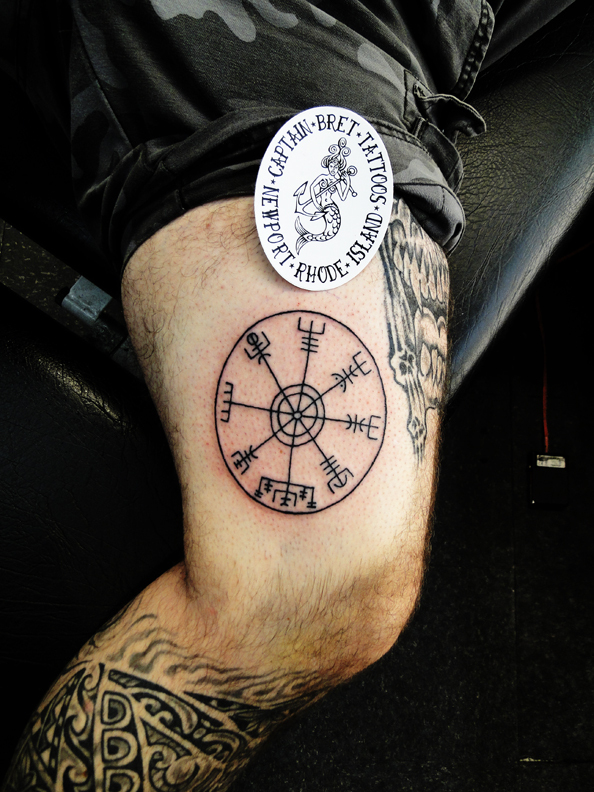 Others get Viking tattoos fascinated by the Norse mythology, culture and beliefs. 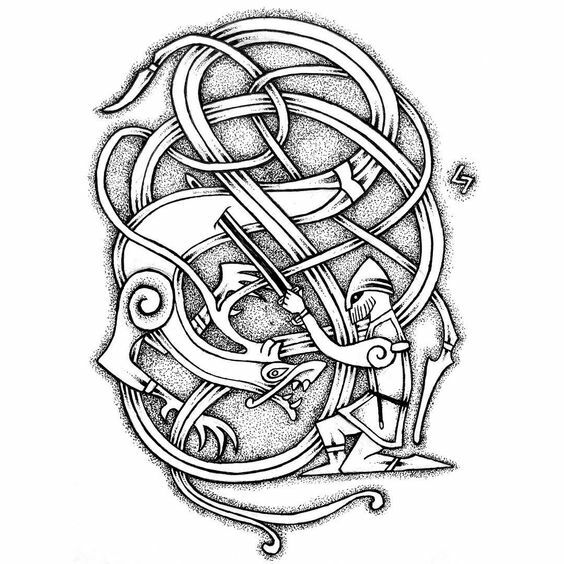 Many tattoo artists have designed Viking tattoos, which can be easily found in many places online. 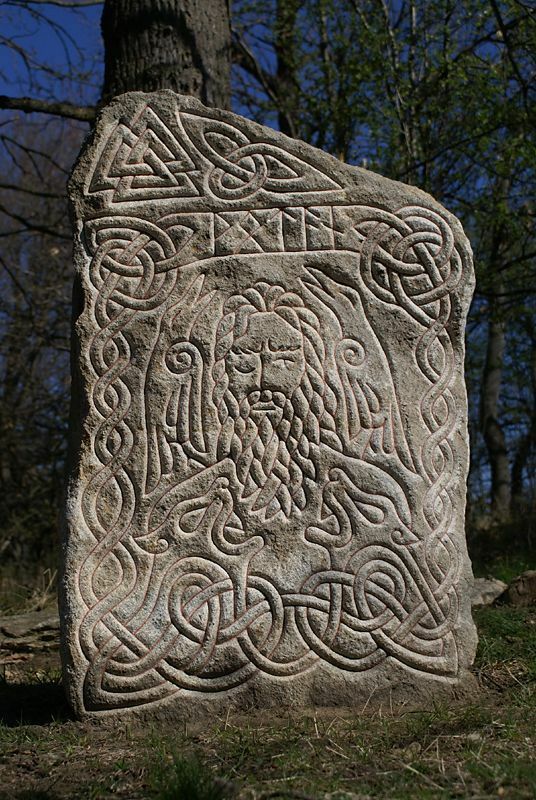 Odin was the principal god in Scandinavia. 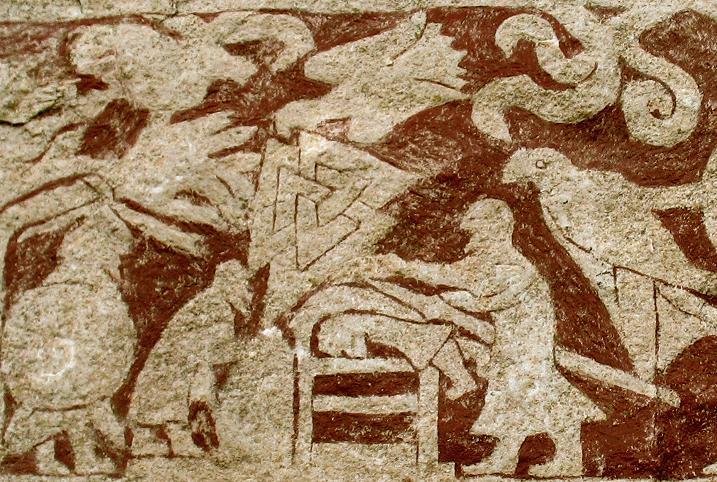 Viking symbols play a large role in their iconography, just as they do in all societies. 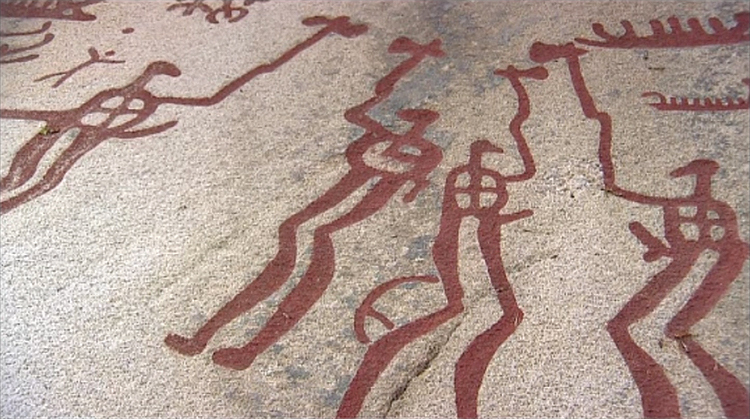 Symbols are cultural shorthand, a sign that conveys layers of meaning about the culture. 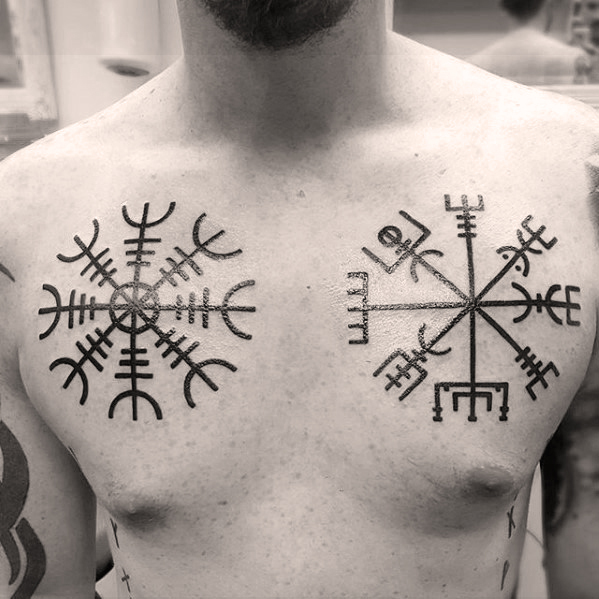 The pagan Vikings used symbols to represent their gods, beliefs and myths. 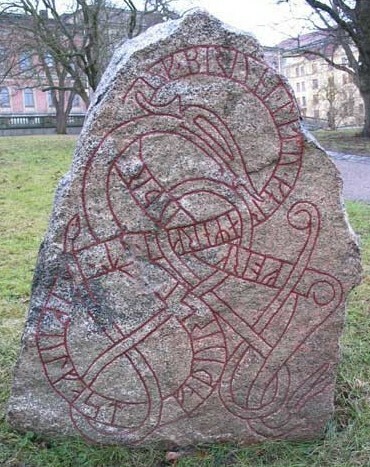 Cultural symbols can take any form, such as sounds, gestures, words, pictures and images. 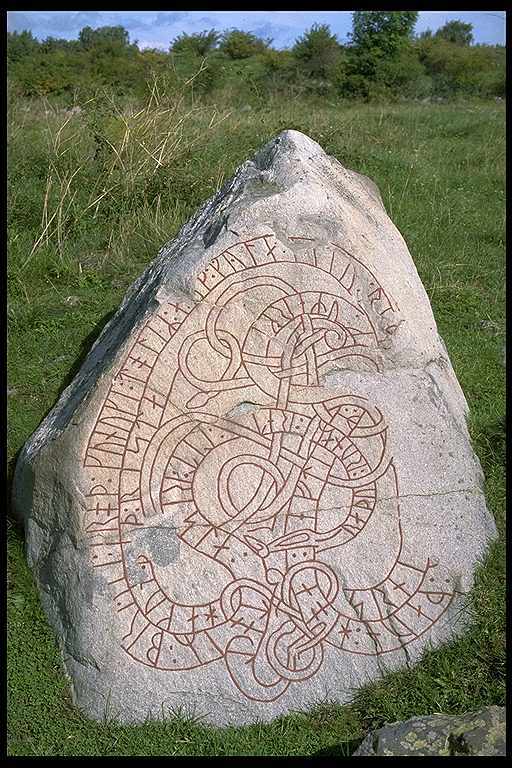 Most of the Vikings symbols we know about were carved on rune stones, swords, axes and other items precious to the Norse people. 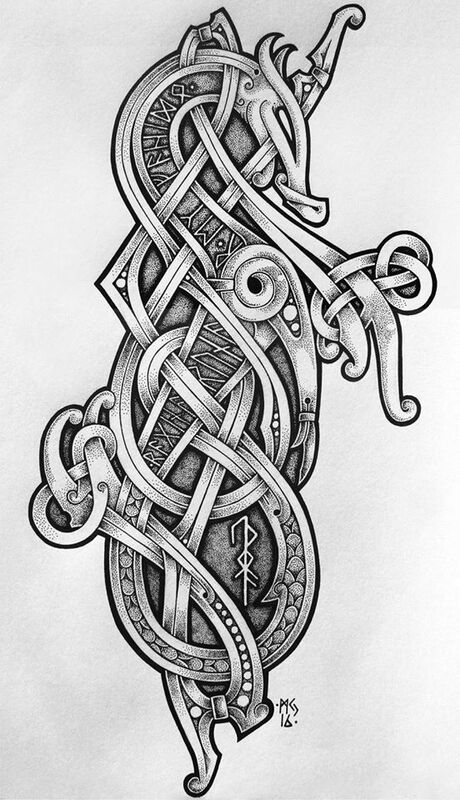 The sagas refer to amulets the people wore, such as Thor’s hammer, Mjolnir. 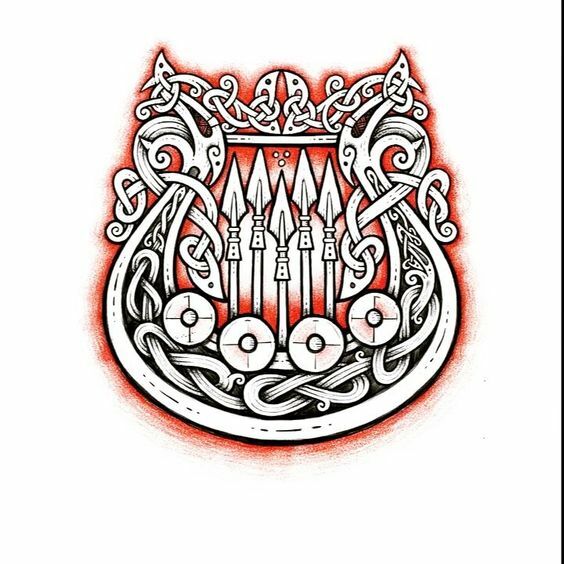 In the article on Viking art, we learned that the Vikings loved decorating the items around them, their weapons, bowls, tools and combs. 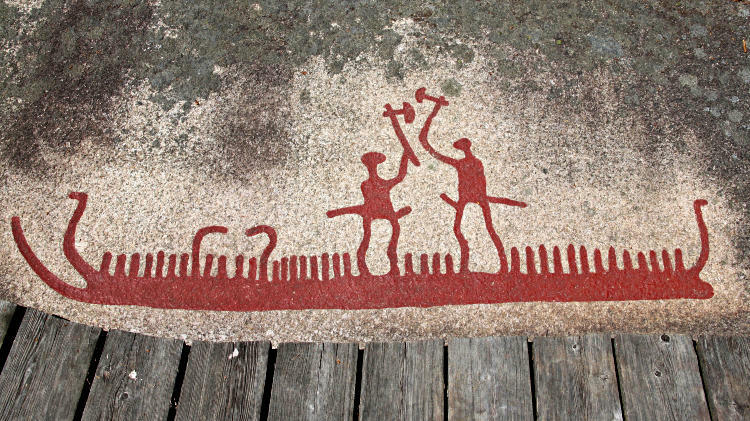 They used their symbols in the decorative arts, in weaving, bone carving and in jewelry. 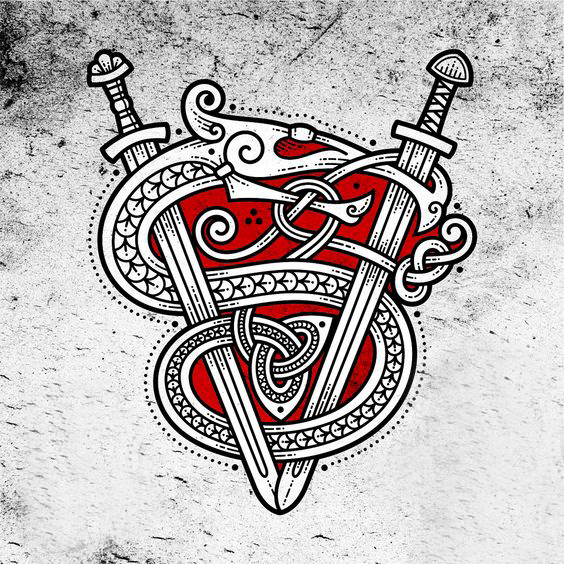 While some Viking symbols remain mysterious in that we don’t know exactly what they represent, but others have clear meanings. 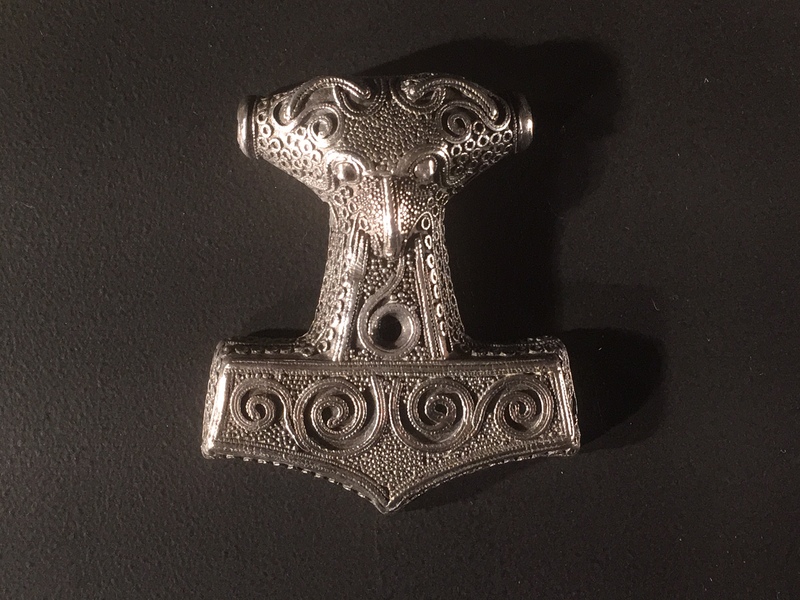 Many Vikings wore Thor’s hammer on thongs around their necks. 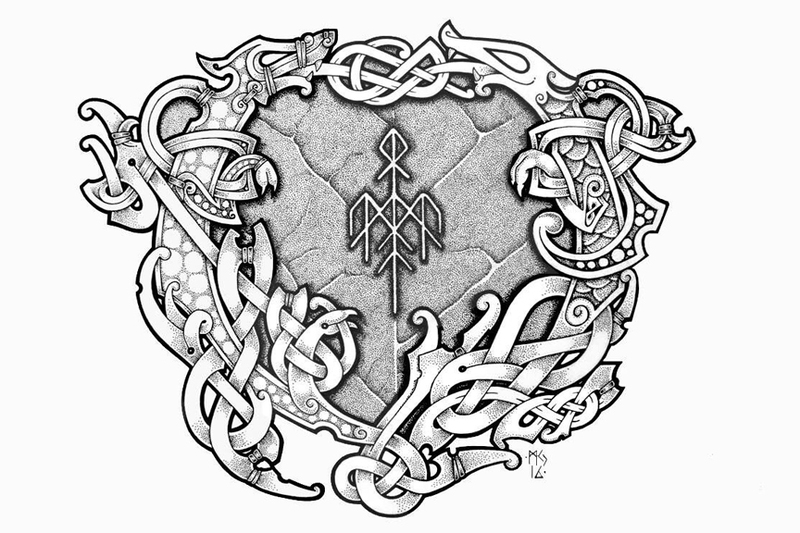 Jewelry, rune stones and valuable weapons were often engraved with the symbols that mattered the most with the Vikings are the Valknut, the Helm of Awe and Thor’s hammer. 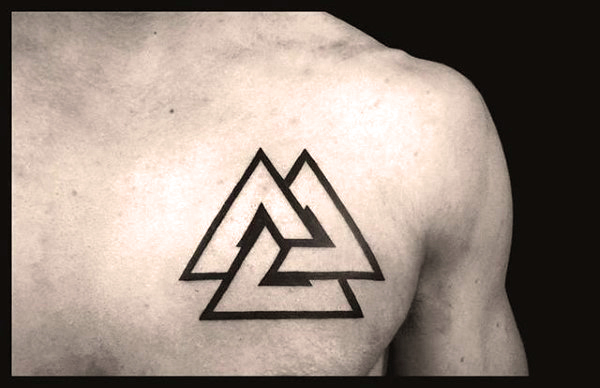 The Valknut is a mysterious Norse symbol consisting of three interlocking triangles. 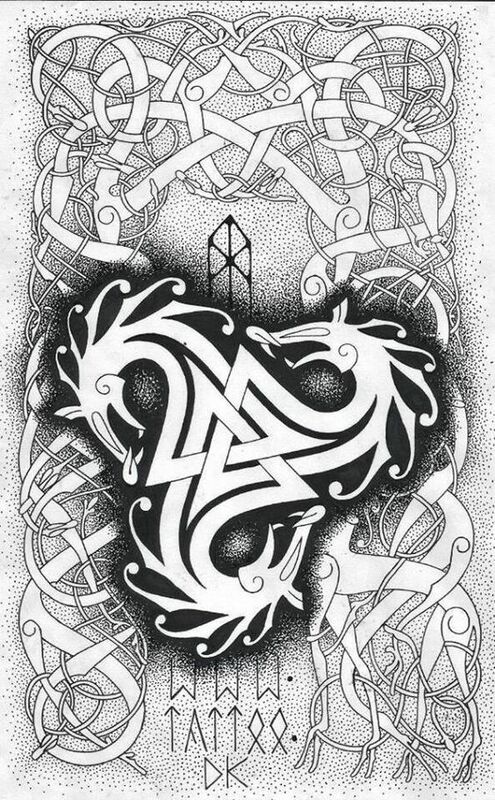 The word Valknut came from the Norse words valr “slain warriors” and knut “knot”. 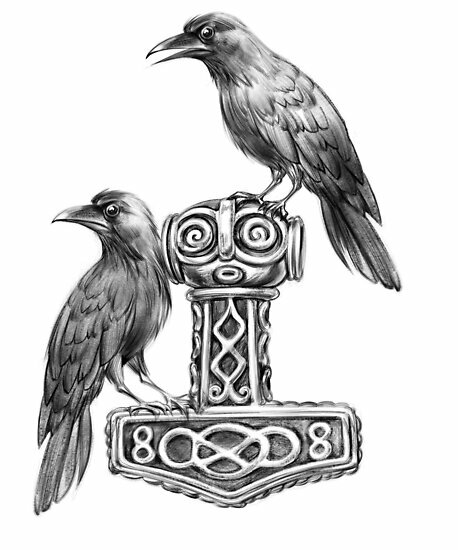 According to the archaeological record the symbol was found on several rune-stones and carved on various objects found in Viking ship burials so it is often associated with the idea of death in a battle and symbol of Odin in Norse mythology. 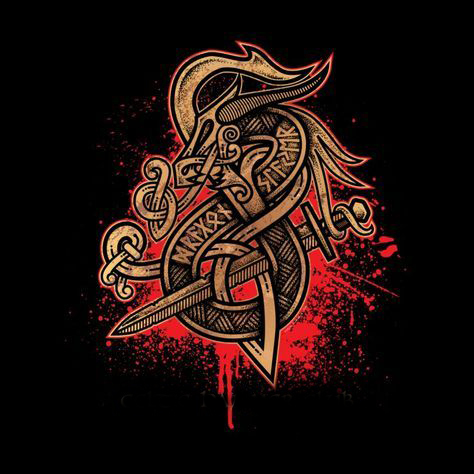 The nine points of the three triangles symbolize the nine worlds of the Vikings, which will be discussed in the section on Norse mythology. 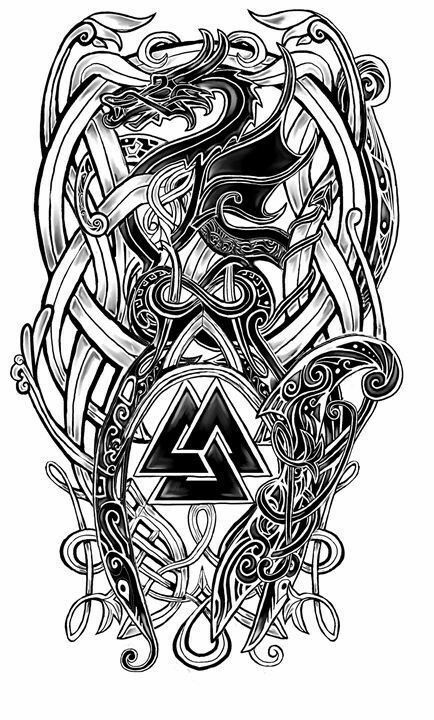 The Valknut is representative of Odin, the father God of the Vikings, and his power of life over death. 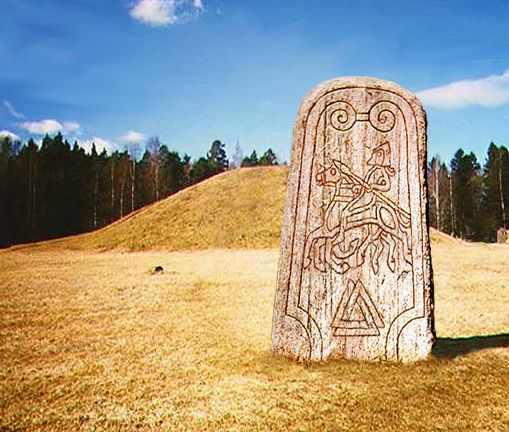 The Valknut is often carved on funerary steles and memorial runestones. 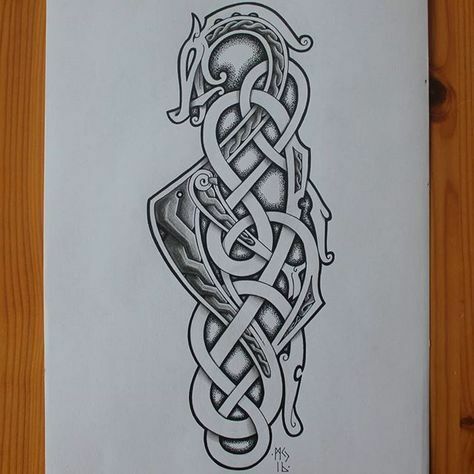 Triple horns of Odin is a Viking symbol made of three interlocking drinking horns which is a symbol of the Nordic god, Odin. 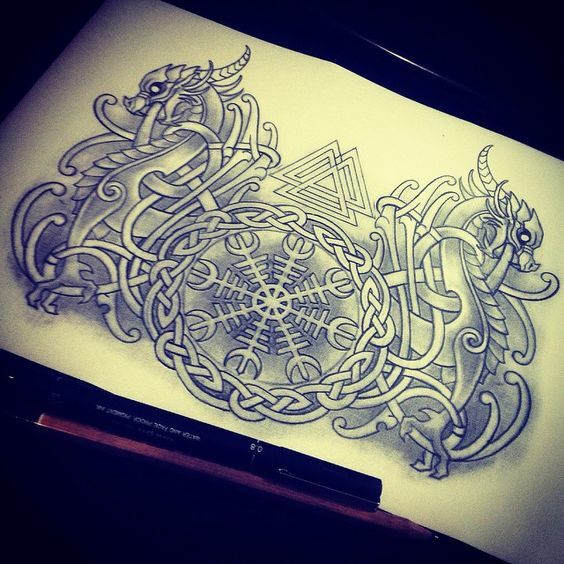 Triple horns of Odin also referred as a symbol of Wisdom. 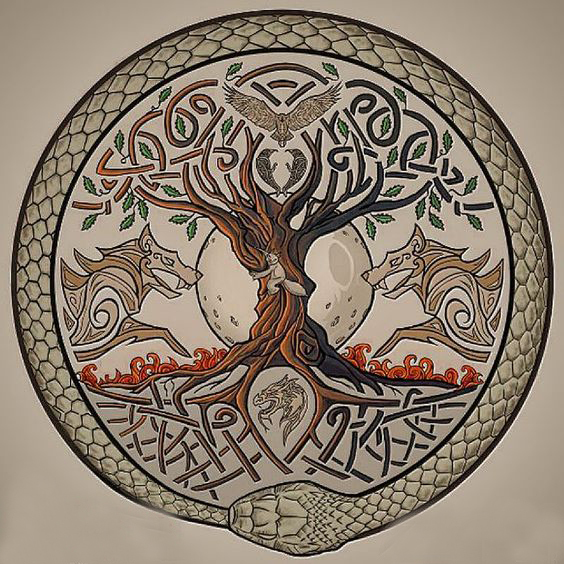 Yggdrasil is the TREE OF LIFE. 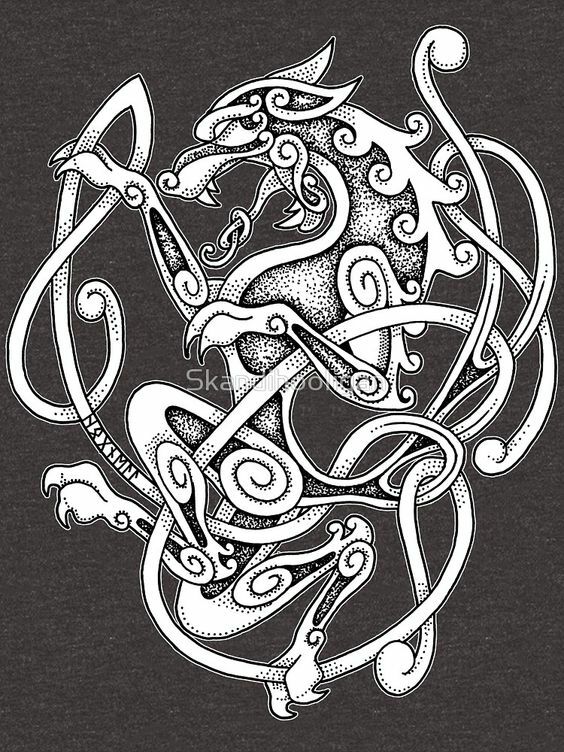 In Norse mythology it is believed that Yggdrasil is a giant tree that connects the nine worlds and held them together. 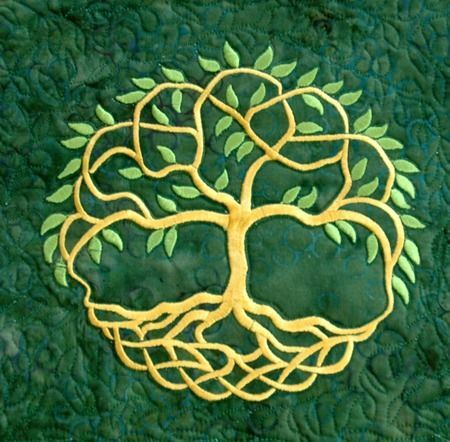 Its branches stretch out over all the nine worlds and extend up and above the heaven. 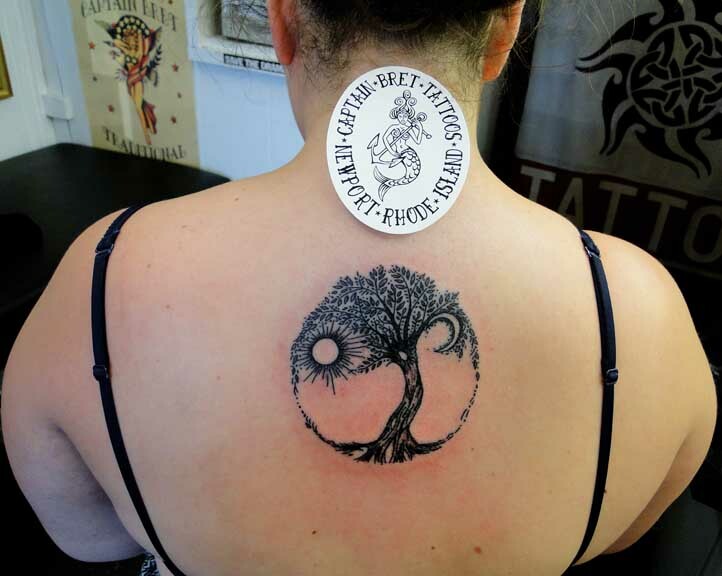 Yggdrasil is also known as the frame of the universe and the spine of all existence because it holds the worlds together. 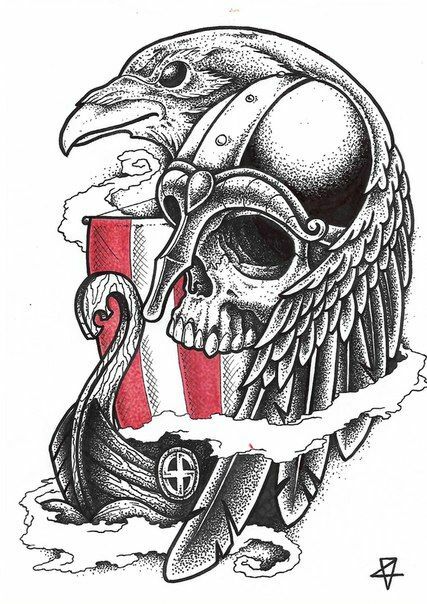 The term aegishjalmr means the helm of awe or terror. 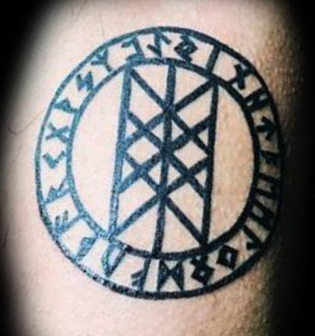 The symbol was used most often in magic to induce delusion or forgetfulness. 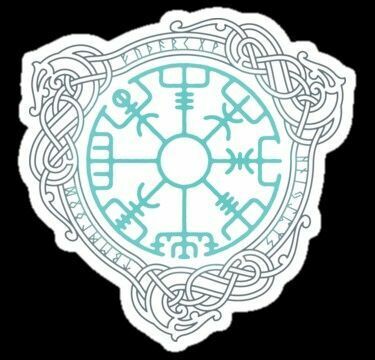 A special form of magic called seior was used to create illusions or to prevent people seeing things as they really are. 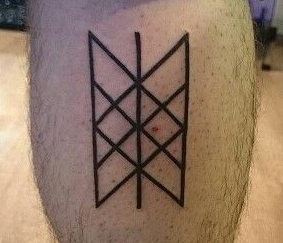 Thus, this symbol was used to hide someone from his or her pursuers. 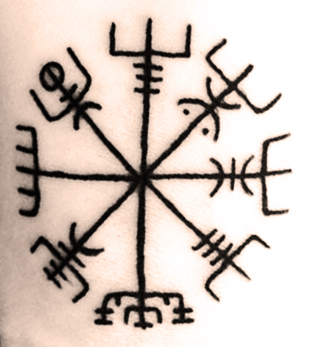 According to the Norse Mythology Vegvisir is a magic stave that helps the bearer to find his way through storm and bad weather. 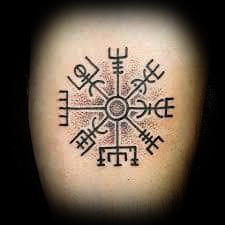 In Icelandic language Vegvisir means way finder. 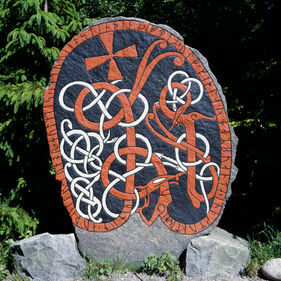 It is also known as Viking compass that is made of eight rune staves. 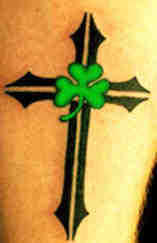 It is the symbol of Protection and Guidance so people tattoo this symbol as a reminder not to loose their path in life. 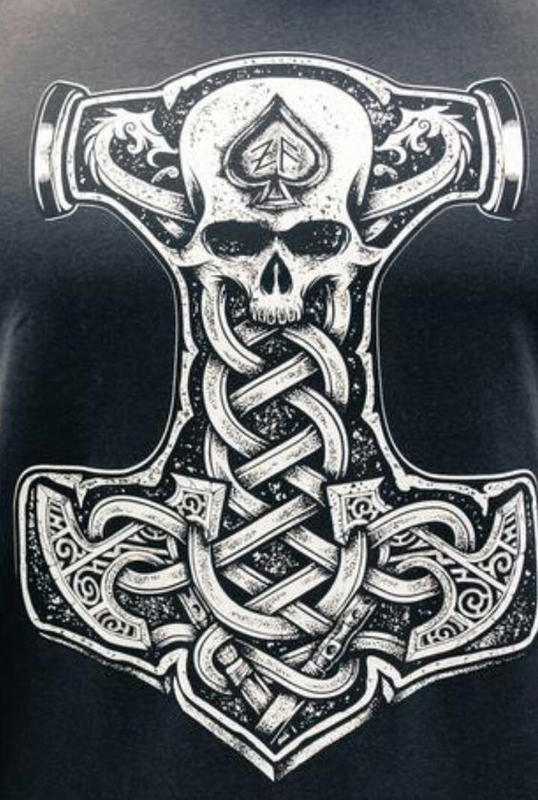 Thor is the god of thunder, lightning and storms. 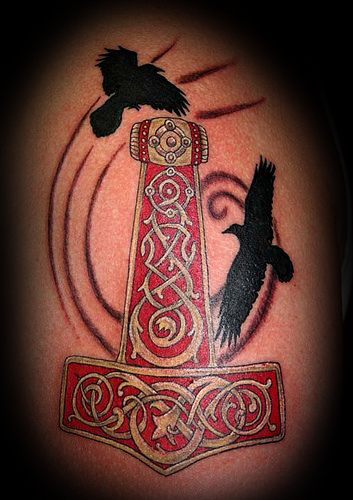 provides protection, strength and power to its bearer. 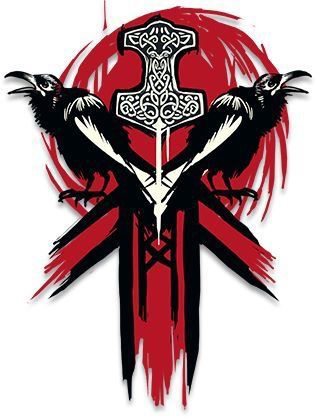 the projections of Odin’s consciousness. 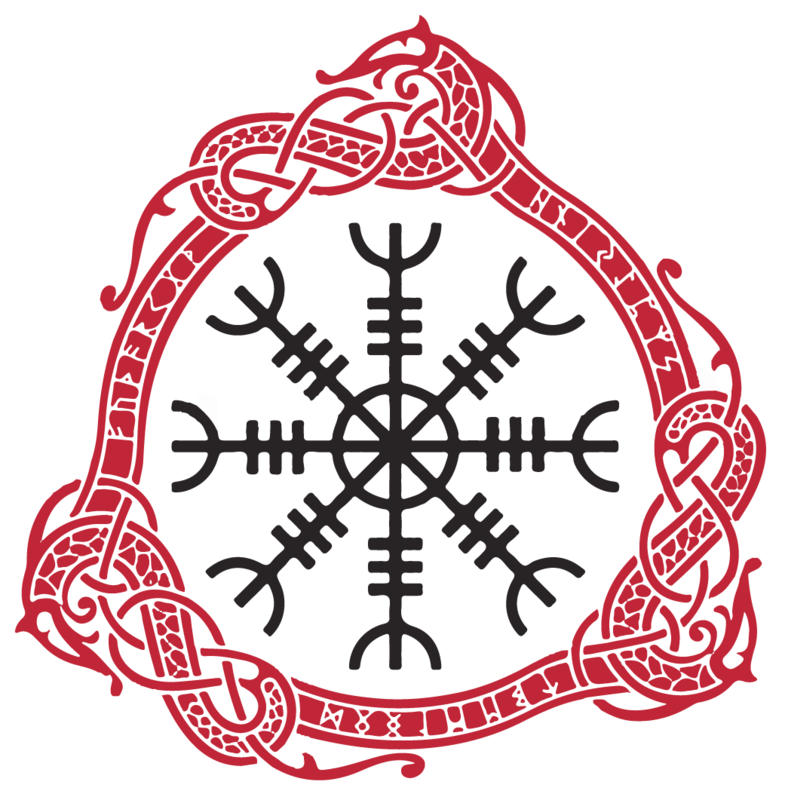 Web of Wyrd (Skuld's Net)- The web of Wyrd serves as a reminder that the actions of the past affect the present and that present actions affect the future. 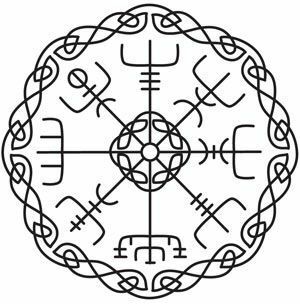 The web of wyrd also known as Skuld’s net is the Norse matrix of fate. 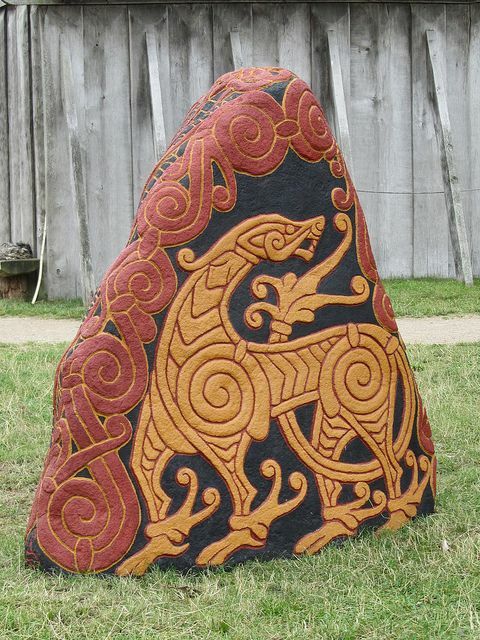 This net was supposedly woven by the Norns. 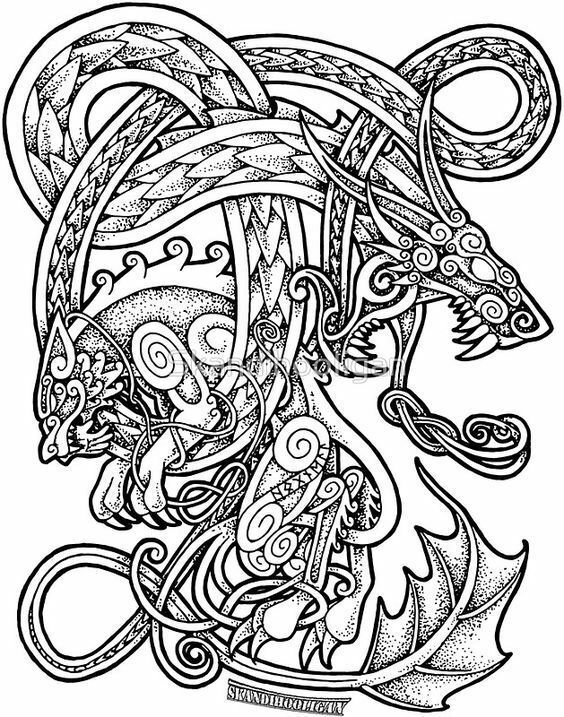 The Norns were the Shapers of Destiny (or the fates) in the Viking mythology. 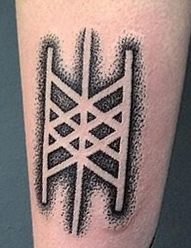 The emblem is consist of nine staves arranged in an angular grid, contains all of the shapes of the runes and represents all the possibilities of the past, present, and future. 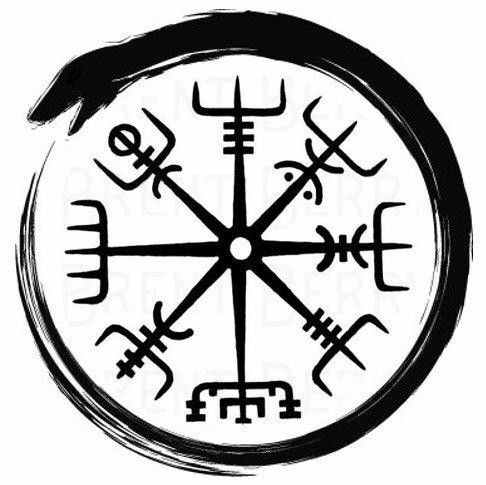 The web of wyrd is a reminder that the actions of the past influence the present and the present actions affect the future; all timelines are inextricably interconnected. 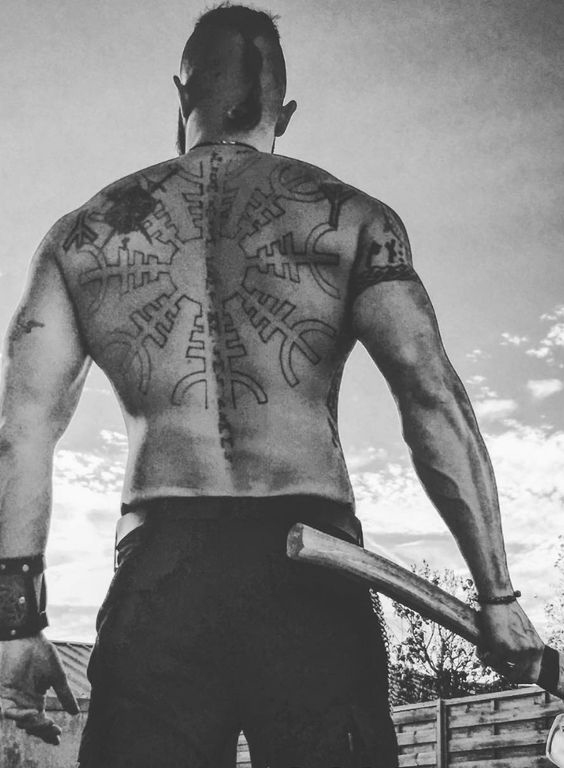 The Berserkers were a cult of warriors who worshipped Odin and who, under the influence of drugs, mead and mushrooms, possessed an uncontrollable fury. 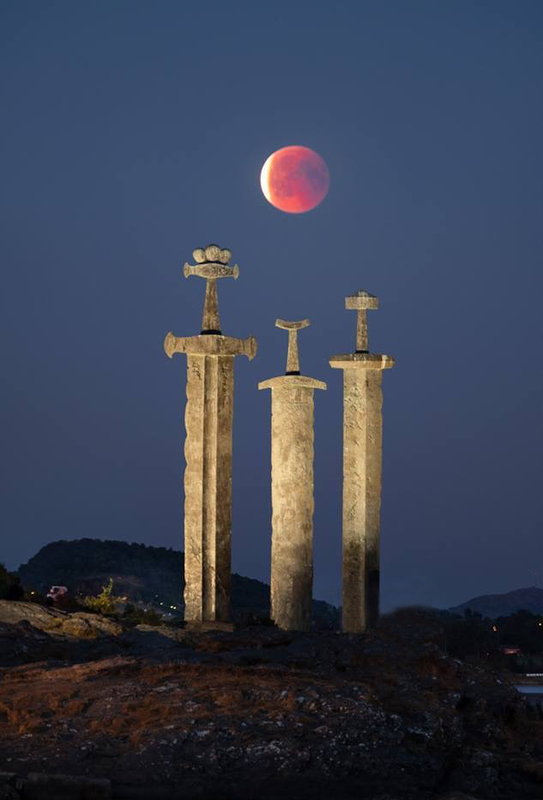 It should also be noted that these fierce fighters also praised God Tyre and that they would even be the result of its creation. 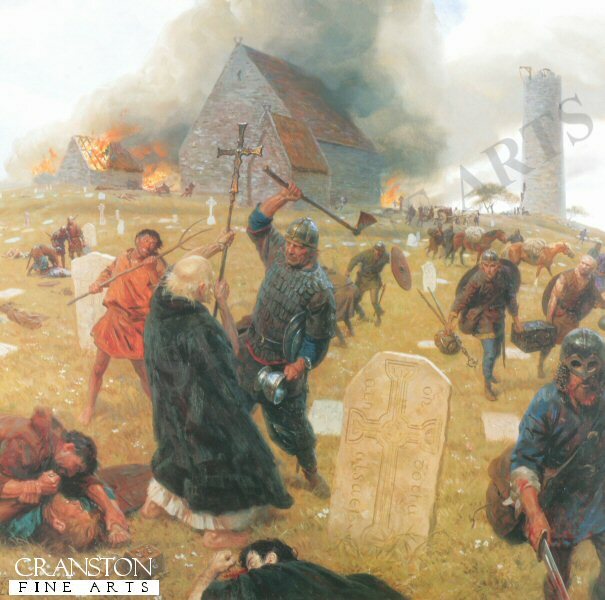 They were dressed in bearskin to frighten the little people who feared wild animals and howled by hitting their own shields. 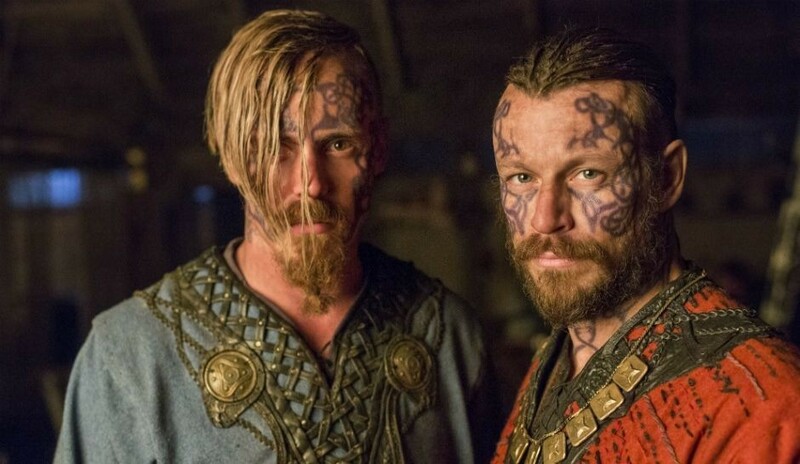 My interpretation is that they really got Hard while they fight ! 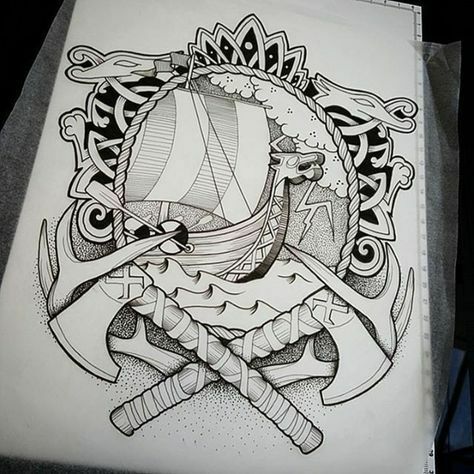 Viking historic Tattoos to our clients. 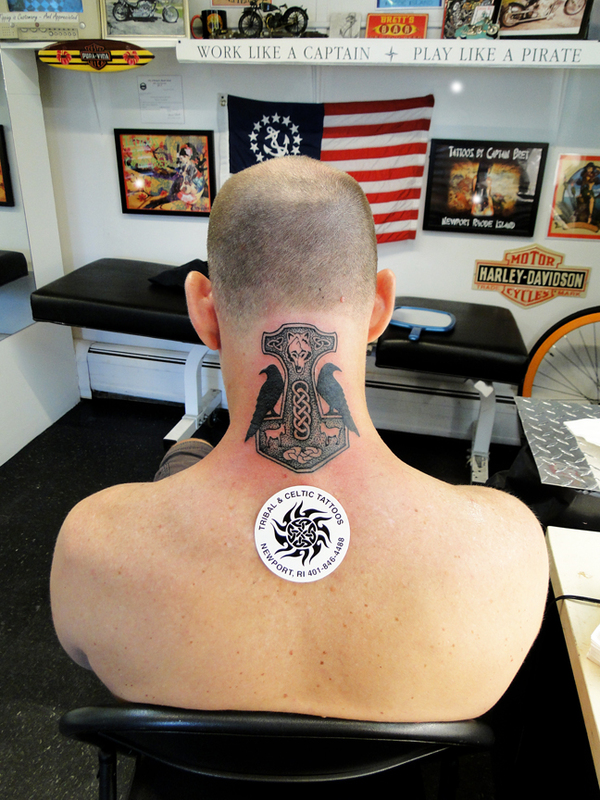 Viking Tattoos Are gaining in popularity worldwide. 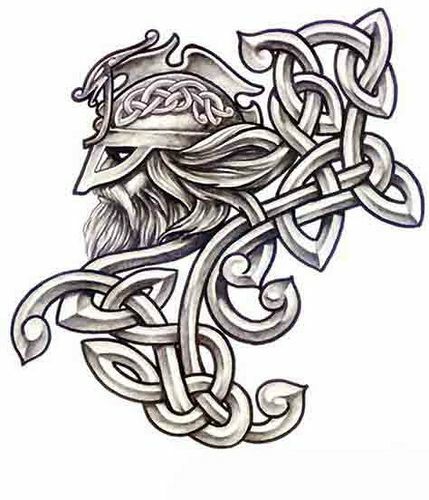 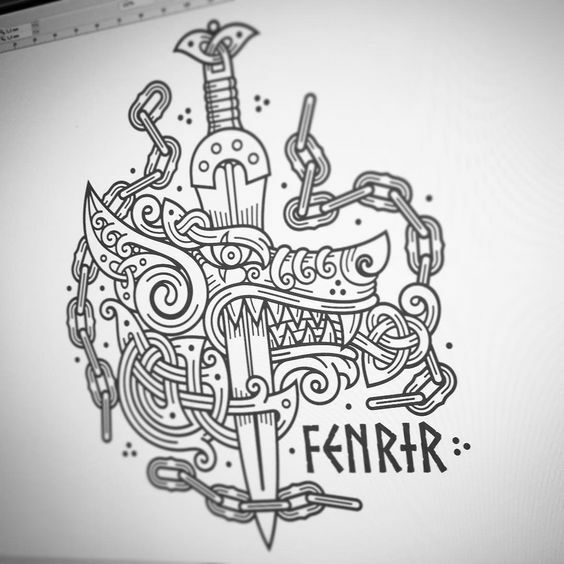 Herein are ideas and images for Viking Tattoos that we have collected from the internet that other great artists have created. 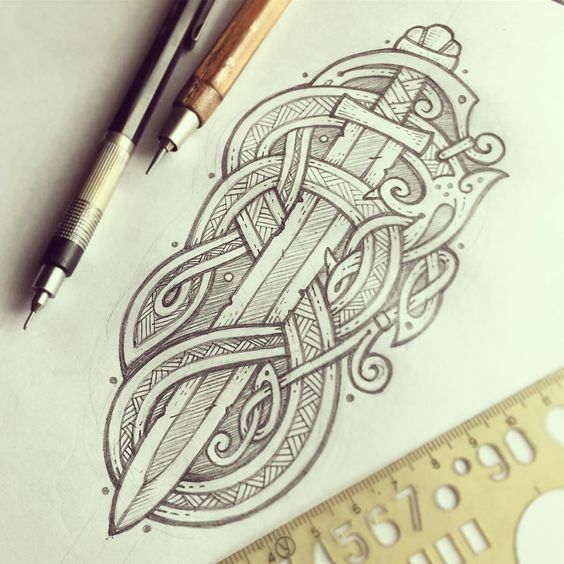 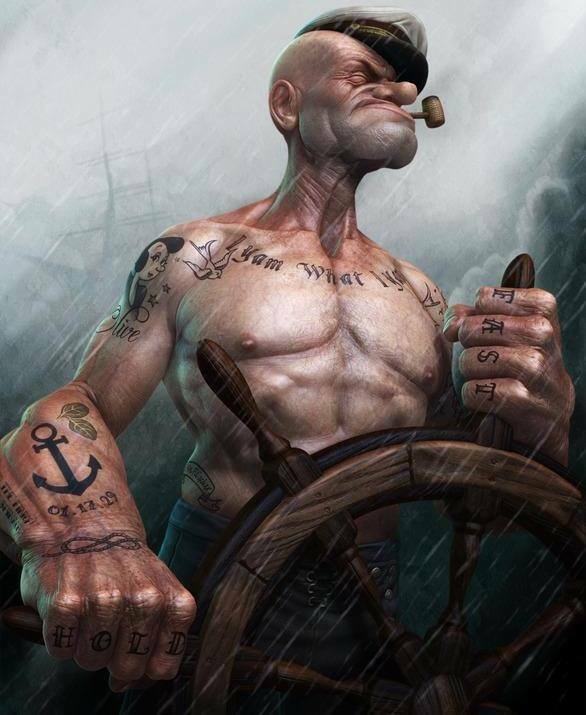 Maybe you will get an idea from these powerful images and consult us to custom design a Viking Tattoo for you.